Basic sensor (light sensor) data collected using an Intel Edison & sent using the SIGFOX network. I had the chance, at an Intel IoT Hackathon taking place at Usine.io in Paris, beside an Intel Edison Arduino board and a bunch of Grove sensors/actuators, to also get the new Akene board from Snootlab. I decided to build a small light sensor station, with the Intel Edison board, the Grove shield, the SigFox Akene Shield, and an I2C Grove TSL2561. This station will upload, through the SigFox network about every 10 minutes, 3 different values (in lux) relating to that 10 minutes period: the arithmetic average light, the minimum and maximum light. That will allow to know how the light fluctuate around its average value for this period of time, and therefore to get the big picture on how the sky could be cloudy (if some wind at least to push the clouds…). I will use Python for that project. I assume that the Intel Edison environment is ready for Python, and a password is set on the Edison in order to open SSH sessions and also SFTP to upload the python code. I am using OS X, and will use CoolTerm for communication, and the excellent TextWrangler as code editor and code uploader (SFTP). The Akene board is an experimentation Arduino shield from SnootLab with the TD1208 SoC (System on Chip) on it. The TD1208 is a SigFox-certified radio transceiver combined with an ARM Cortex M3, which implements the telecommunication modem stack for sending values to the SigFox operated telecommunication network, and also includes I2C capabilities for IoT sensors, beside its serial modem link. SIgFox services rely on a LPWA (Low-Power Wide-Area) network currently deployed in Western Europe, San Francisco, as well as other countries or cities. The SigFox protocol is designed for small messages and its technology is focusing on energy efficiency for devices clients and large area coverage for each infrastructure base station. The SigFox network allows each device to send up to 140 messages per day (i.e. every 10mn), each of them up to 12 available bytes i.e. 6 short integer values (the timestamp and the unique device ID are also transmitted in addition). The Akene Shield uses pins 4 & 5 to communicate with the Sigfox module. We can consider the TD1208 as a modem. The PySerial package has to installed. which return the list of commands available. This is a fast adaptation of a python command dedicated for another TD1208 board (RPISIGFOX from SNOC) and found on internet. 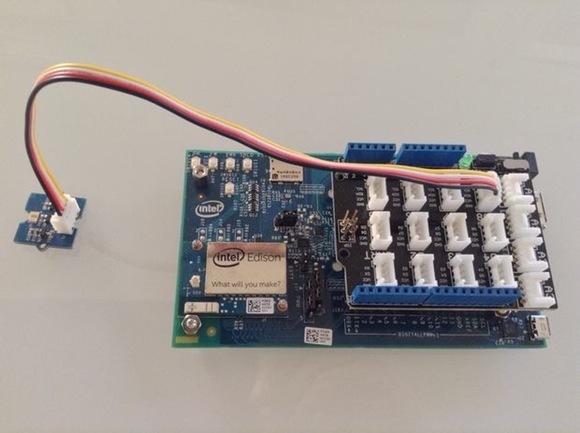 #  This script allow the control of the SNOOTLAB expansion board, and is adapted for Intel Edison. #  This script is from the rpisigfox expansion board for Raspberry Pi. #  V1.0 allow only to send regular message on the SigFox Network. #  where MESSAGE is a HEXA string encoded. Can be 2 to 24 characters representing 1 to 12 bytes. print "after", numberSamples, "samples (values in lux):"
print "Light (values in lux):"